The Speedwinch is ideal for retrieving moose, elk and deer over long distances quickly and easily! Makes getting your game out of the field and into your truck easy. It is especially effective in western states like Wyoming where hunting access by vehicle is good, but kills are often made 300 yards or more from the nearest road or two track. The Speedwinch capstan winch began as a project of a retired NASA engineer and long time elk hunter. He recognized the need for a winch capable of retrieving North American big game over long distances in tough terrain. Finding no winches optimally suited for hunters he set out to develop a winch specifically designed to meet their needs. The capstan style winch was selected because it can use any length of rope allowing for very long pulls (much longer than a standard drum type winch). The winch evolved over a period of about twenty years into a product that resembles the Speedwinch of today. It is at that time that his son, also a hunter, but recognizing the needs of arboriculturists and other industrial and recreational users, took the operation to the next level. His experience with 3D Design and modern fabrication processes enabled the production of the winch you see today. Now you can also enjoy the benefits of using the Speedwinch Capstan Winch. Unlike most other electric winches that use small series-wound motors that can only be run for a few minutes, the Speedwinch uses a heavy duty permanent magnet motor that is capable of running for extended periods of time. Unlike gas powered winches, the Speedwinch is quiet and will start every time, even when stored for long periods of time. The Speedwinch performs equally well at high-altitudes and in cold weather conditions, and it doesn't require you to carry gasoline. You don't have to worry about the choke, jet size, idle settings, or throttle settings like you do on a gasoline winch, the Speedwinch just starts and runs! In addition the Speedwinch does not face gasoline engine use restrictions that are becoming increasingly prevalent on public land. Unlike hydraulic winches, the Speedwinch doesn't require a power take off unit, hydraulic pump, reservoir, or hydraulic lines to power it. 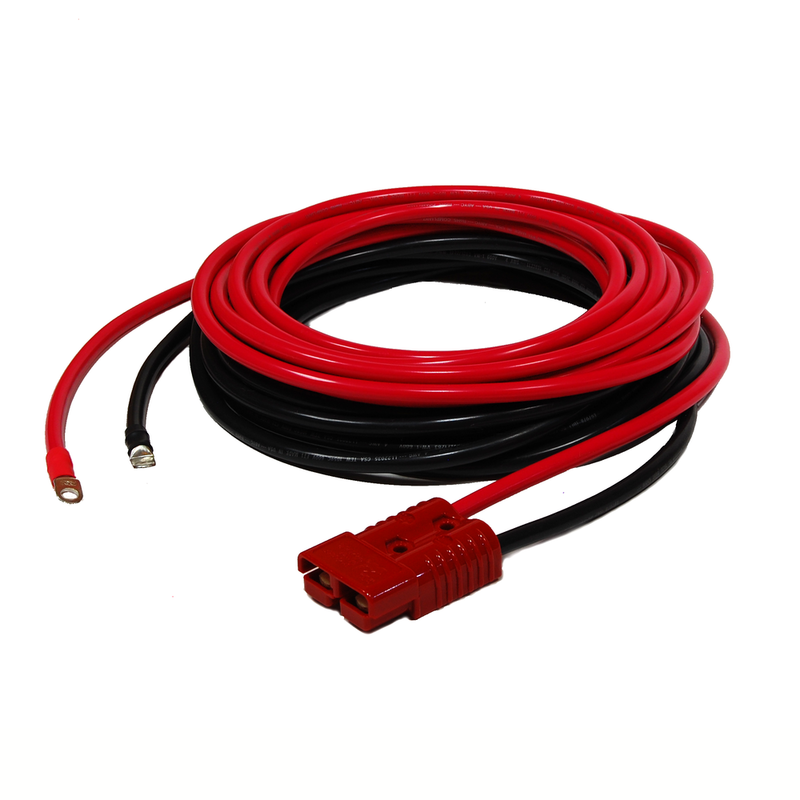 Just connect the positive and negative cables to your battery (using the optional "Vehicle Power Cable Kit") and you are ready to go. The Speedwinch is designed to use Amsteel Blue rope by Sampson. This rope has several advantages when coupled with the Speedwinch. Amsteel Blue stretches much less than other ropes, which means it doesn't store much energy. This helps to keep the operator safe and makes pulling easier. This is particularly important on long pulls. Amsteel Blue is very strong, the 3/16" rope we recommend has an average breaking strength of 5400 pounds. Amsteel Blue is also very lightweight--400 yards of 3/16" rope weighs only 12 pounds (5 Kg). Lightweight rope is important. When you have to retrieve a moose or an elk, or skid a felled tree several hundred yards away in rough country, carrying a large and heavy bag of rope on your back is the last thing you need to look forward to. 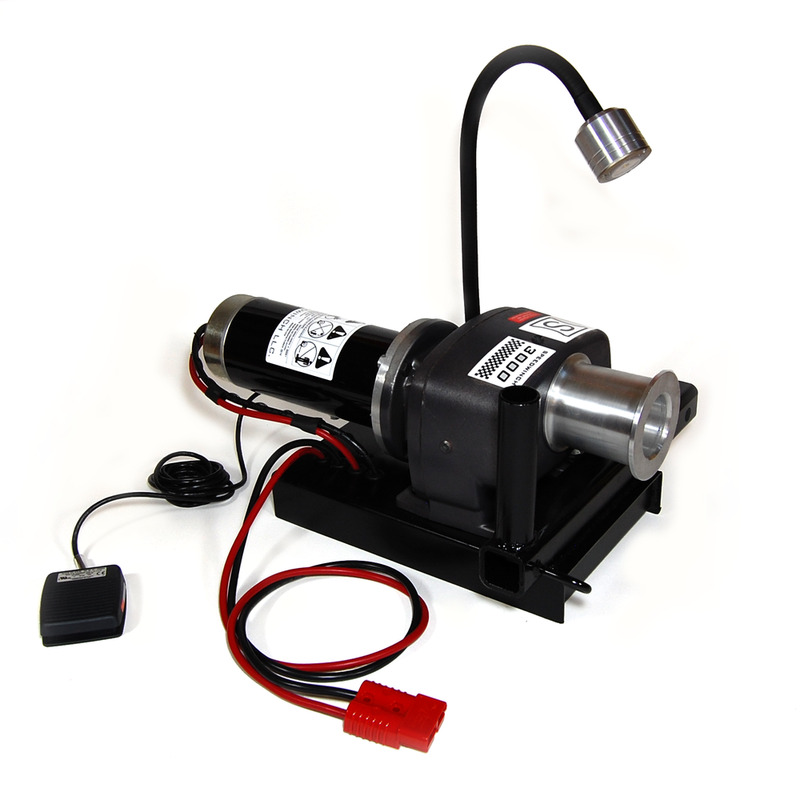 The Speedwinch design incorporates many features not always found in other products including an integrated electronics package, a LED task light to enable work to continue even under poor lighting conditions, an easy to use foot switch for turning the winch on and off safely, and an optional vehicle power cable kit to make installation easy. Unlike many of our competitors the Speedwinch does not require a bunch of mounting accessories just to get started, simply plug it into your hitch receiver! Premium quality high value products are the cornerstone of our business. With that philosophy in mind we offer winches that are the best in class and built to last.